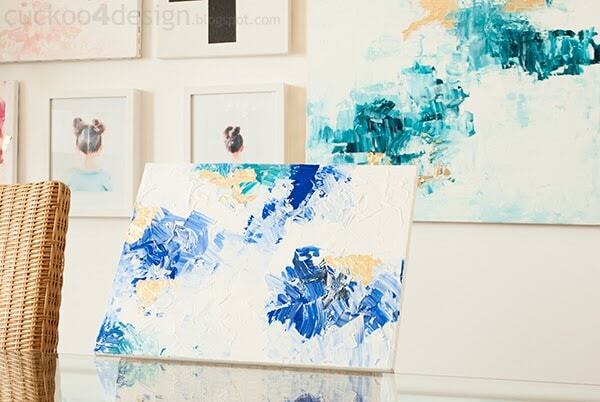 Being creative and creating art for your own home is a lot of fun and can add a special personal touch to your home. 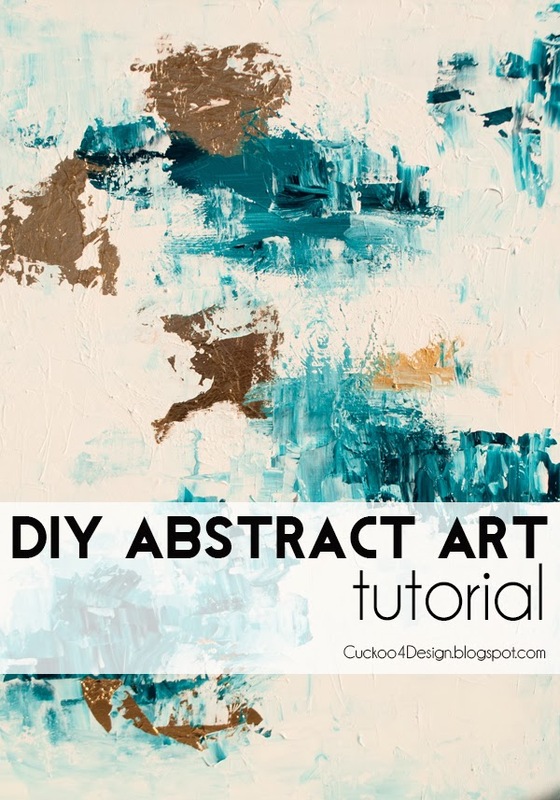 With this DIY Abstract Artwork Tutorial I’m trying to show you how to make an easy, pretty and unique pice of art. It’s something that beginners can do for sure. That’s where the spatula comes in place. 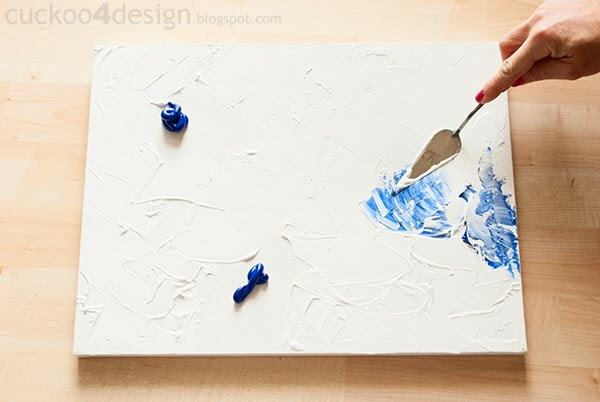 It’s like applying a messy coat of cake icing. I spread out the white first and then slowly work in the color. You can add as many colors as you would like. 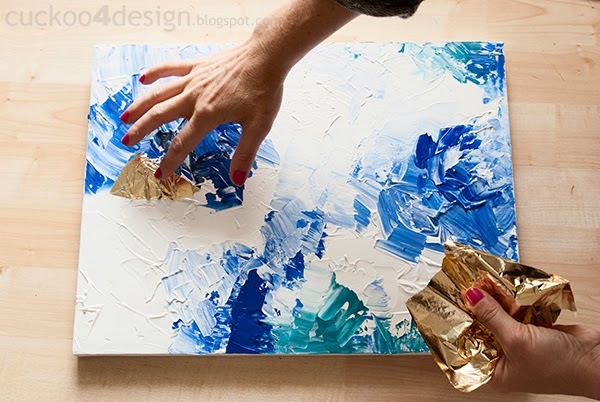 When the gold foil is pressed into the paint, I lightly go over the edges with the spatula and a little bit of paint to make the edges look more random. Then I let the paint dry and apply some gold leaf sealer to the golden areas. 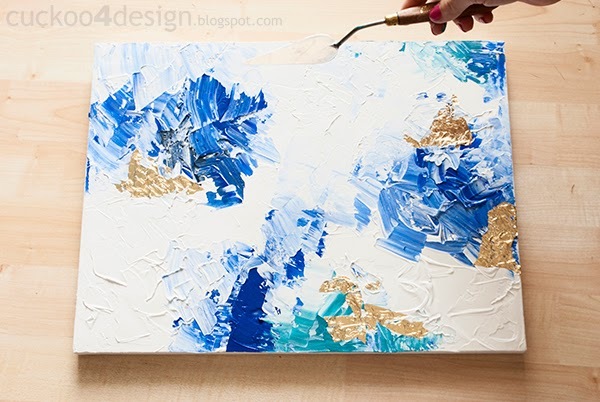 You can also paint the side of the canvas gold or add a frame. 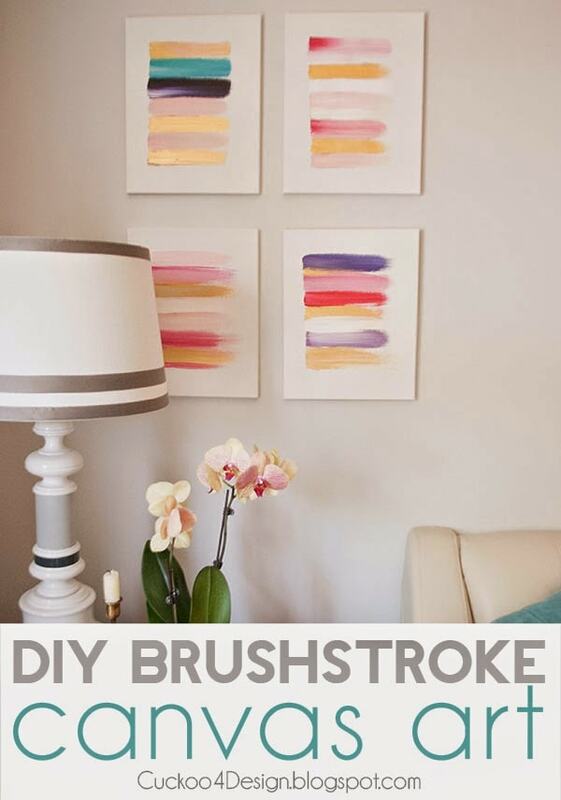 Also see how to paint this brushstroke art by clicking HERE. You should give it a try. It really is very easy. I hope you liked the tutorial and let me know if you have any questions. Talk to you on Wednesday. 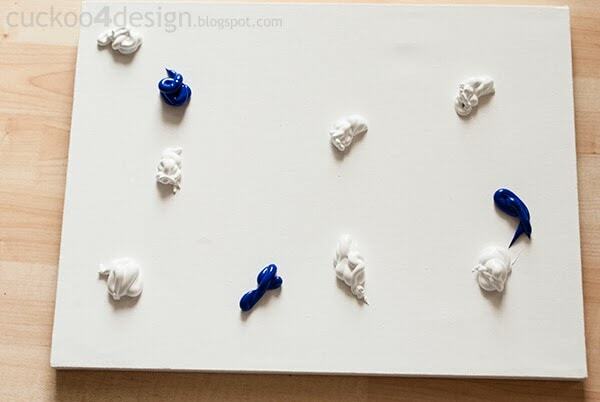 Love this tutorial Julia! 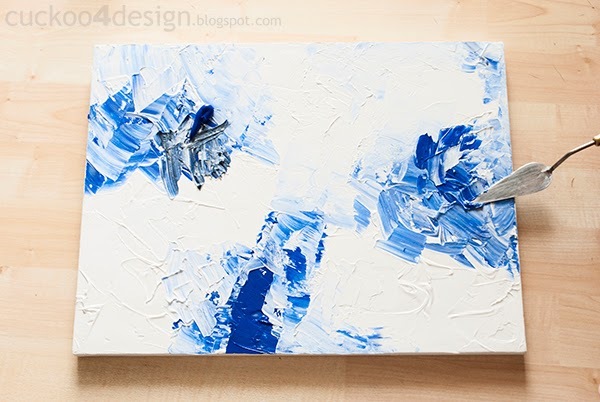 I think we are going to try our hand at some painting soon and this gives me inspiration. Thanks! You make it look too easy Julia! 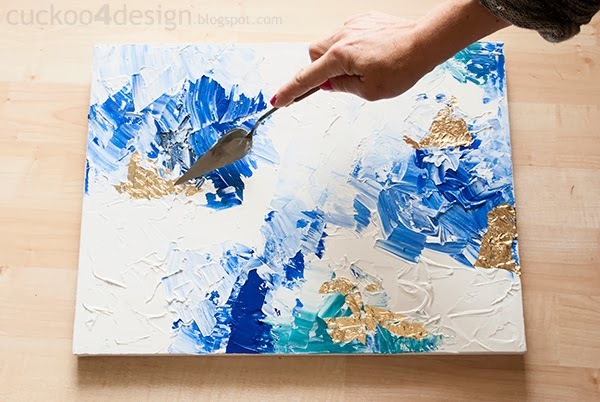 Your abstract art turned out great and I love the touches of gold. I’ve always wanted to try my hand at painting, thanks for the inspiration. Wow, I love everything you do …… I will have to wait on this one…. well a lot of stuff. I just don’t have a penny now that o put his work into play this January 01. Oh well, I am wishing to save money for a Kreg Mini Jig, in order to make a Pup/End Table/Window seat for my very tiny bedroom. Long story, but I just can not take having the metal crate in my dining/living room for any longer… it is horrible and way too large and I have such tiny space. Wish me luck on saving money. I have decided….. no eating, save money….. works. Good way to diet and I know for a fact that if you do not eat, you do lose weight. Of course it is not so healthy, but sometimes necessary. 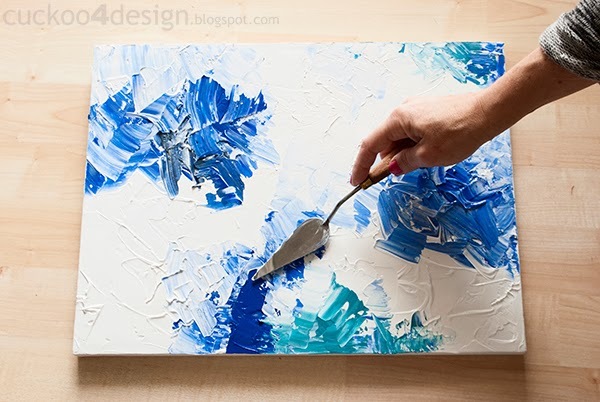 Love this tutorial…I’m definitely going to try it out. Also, I think you would be amazing at Creating with the Stars..are you going to apply? I don’t think I could handle the stress right now. You made it look easy:). Love it! Oh my!!! looks fantastic. Great job and awesome tutorial but I have a feeling it’s a lot harder than it looks — you have such a great eye which translates into a great eye for creating true art! that is fabulous, julia! love the colors and the addition of gold! You totally made that seem easy…like maybe I could even attempt it! I congrats on making it to the finals!!! Love the touch of gold!…and of course just voted for you! 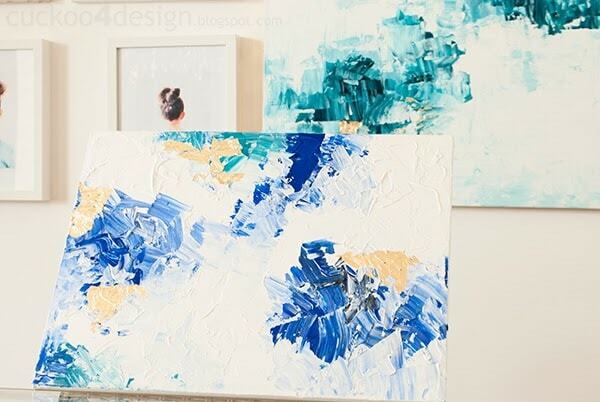 This is so beautiful and such great inspiration to try it for myself! 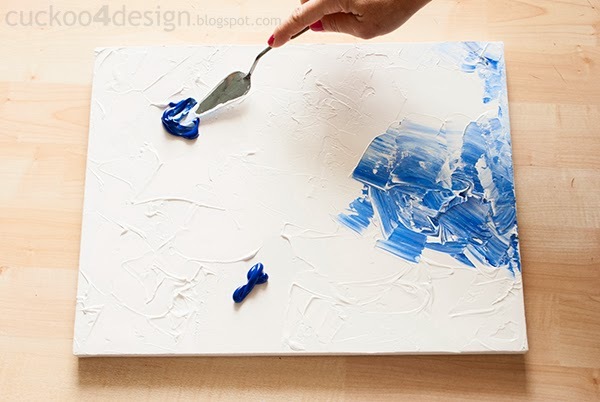 I feel like I would make a giant mess with this but it looks super fun! Yours turned out beautifully! 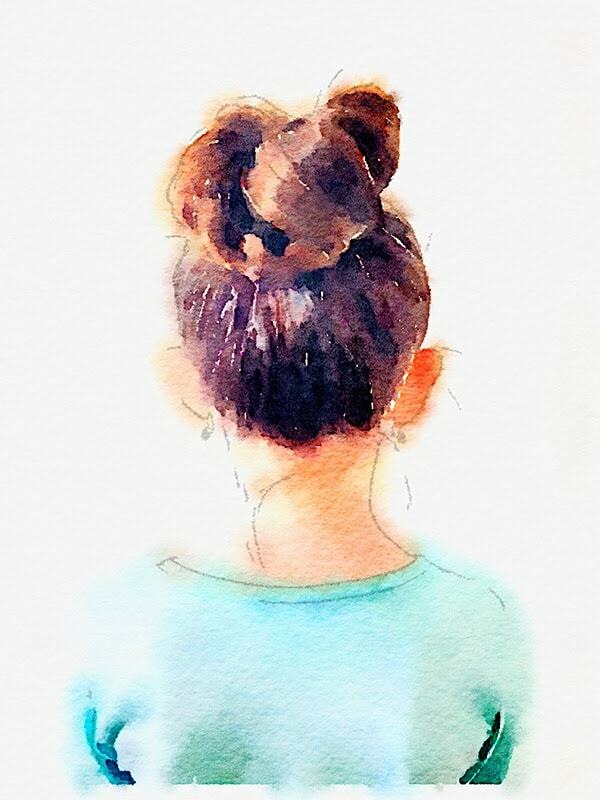 I love this – so glad you shared! 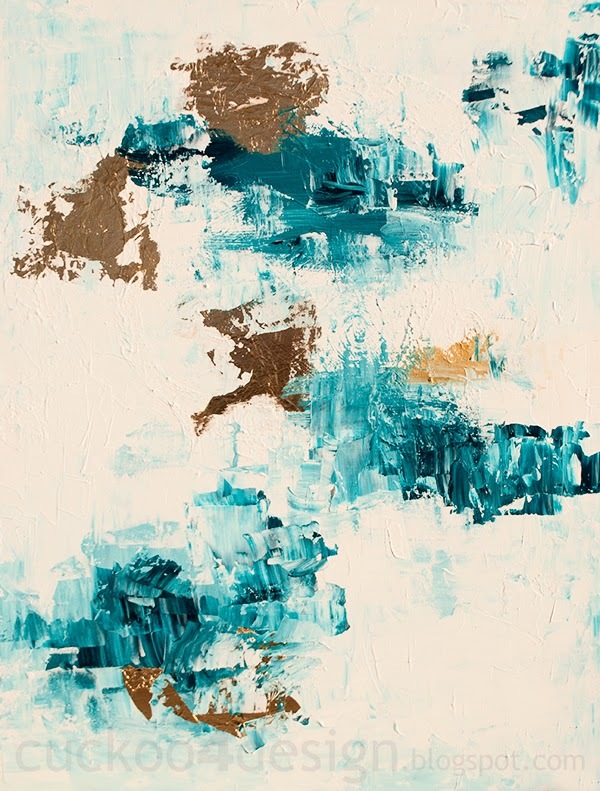 I have an abstract I bought years ago that I want to modify and I think this technique is just the way to do it! Love the touch of gold. 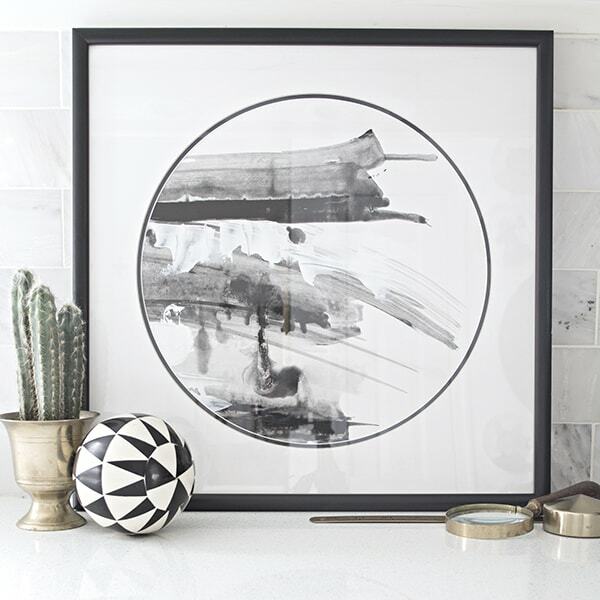 It’s perfect with the texture of the artwork! Let me know how it works out and thanks! Love this! And messily is the only way I know how to put icing on, so maybe this would be perfect for me 😉 Congratulations on making the finals! yours looks so good. I’m so critical of my own artwork that i would probably hate mine LOL! Gorgeous! You make it look so easy 🙂 Maybe I will get up the courage to try again! B-E-A-U-TIFUL! I’m going to have to give this a shot! Love it! And so proud to vote for you! Oh, btw – CONGRATS!!! So excited for you! This is too cool. I love the addition of gold leaf. Such a great touch. I want to try some gold leaf. Can you believe I”m a gold leafing virgin? It’s embarrassing. This is a really neat idea. 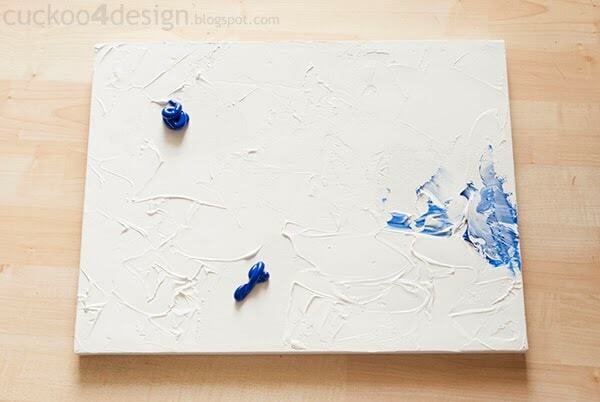 I’m always painting on canvas and I’m going to dabble in this. Your work is very nice by the way. Beautiful! I love seeing it come together on the gif too; that’s so cool! You could totally sell that, my friend. I love this!! Thanks for sharing your tutorial!! I will be trying this soon. Really pretty Julia. Would have never thought of adding gold leaf! Pinning. Love seeing the process. Beautiful artwork! So yeah, how I missed this is beyond me, BUT I love it soooo much. It looks great and super expensive. Thanks so much for sharing it with us Julia. Okay YES now I know what kind of art I want to try next! 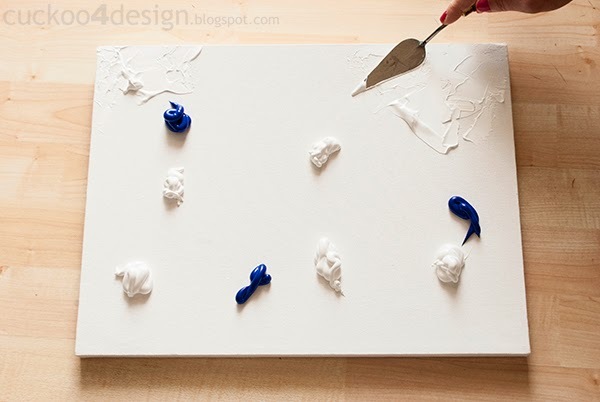 Thanks so much for sharing this tutorial, it looks like so much fun and I can’t wait to experiment! 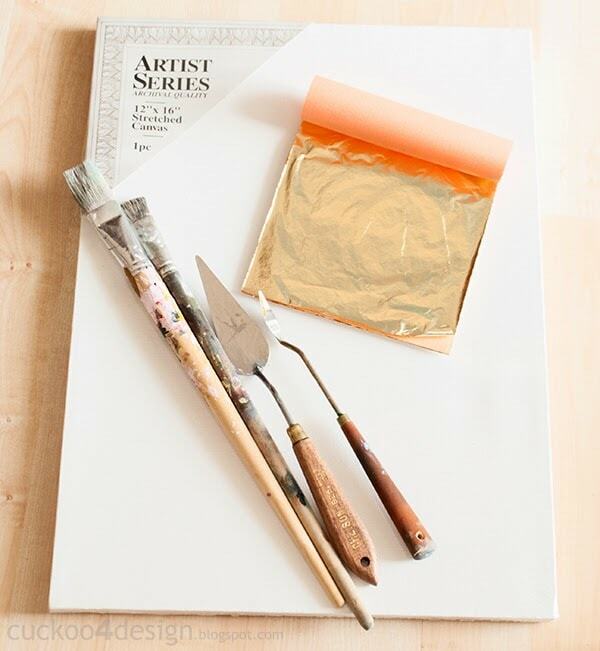 The colors you chose and the gold leaf look beautiful together!! Thanks for sharing this…I am thinking to make one of these for my daughter’s almost here baby room…you can never start too young for art enjoyment!!! 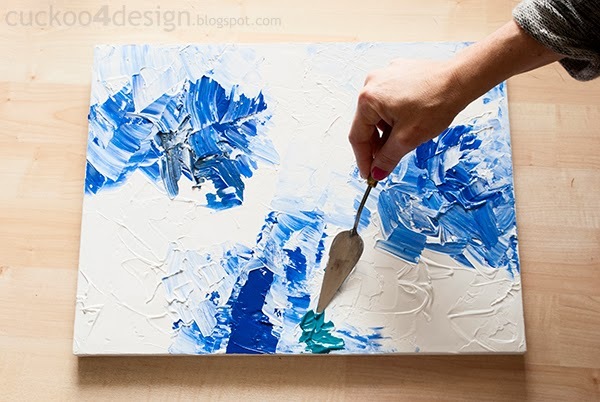 The texture will amazing for touching!!! I just wish I had found this on Pinterest sooner, so I could have voted! It’s fabulous!!! I never thought about that, but you are right, the textured would be great for little ones to touch! I love this (and YOU) so flippin much! Your art is so beautiful. I love it!! Art history was my major in college. So I definitely appreciate this! Is it necessary to add the gold leaf sealer? What does it do exactly? Hi Danielle, I don’t think it is necessary. Just protection according to what it says on the package of the gold leaf. Awesome tutorial. 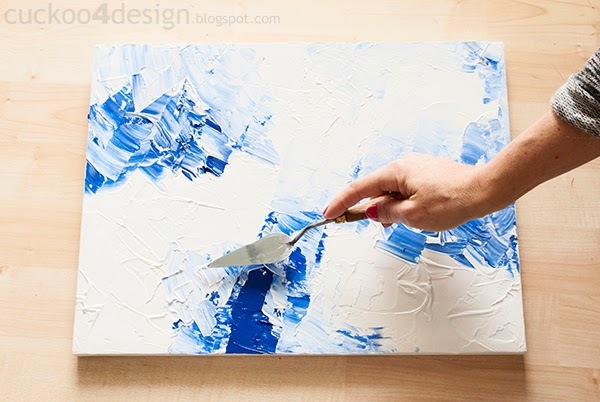 Now I have the courage to take that step and put brush (or spatula) to the canvas. Thanks! 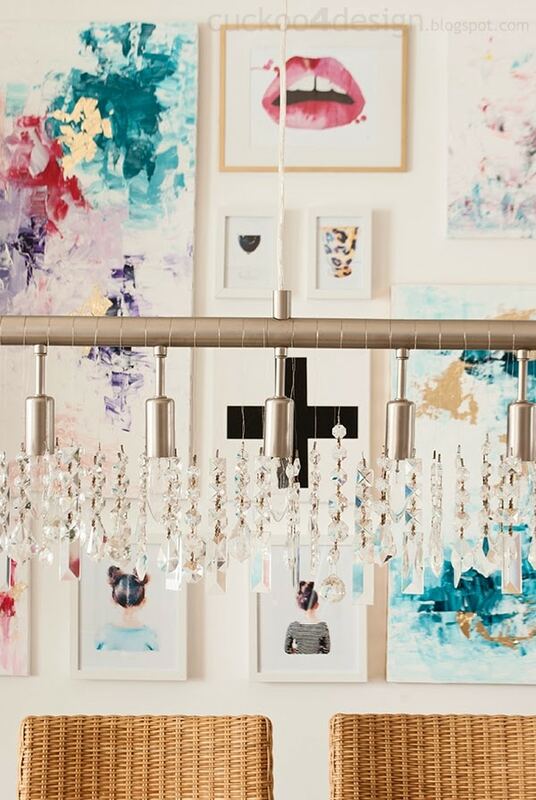 How do you hang your DIY art work without frame. Love it..!!! It’s so beautiful. I am definitely trying this soon. Where can you purchase the gold foil? I’m keen at giving this a go. 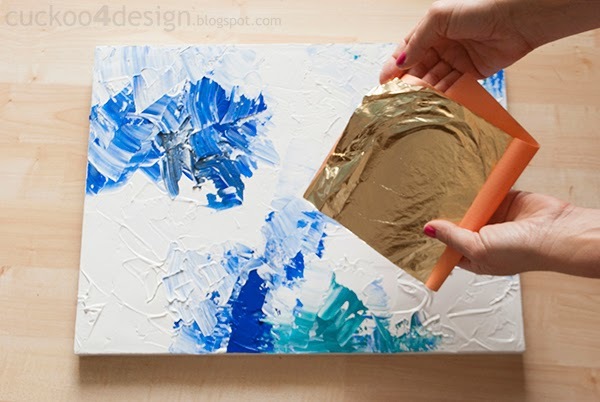 You can buy gold foil in any craft store here in the US. Hope that helps. Hey these are beautiful. Do you sell them somewhere? Thanks and no I don’t sell them somewhere. Your work is just fascinating. Hi Shruti, sorry I didn’t see your comment. I was on a little vacation and things have been crazy around here. I would definitely use the peach color, red, yellow and maybe just a mint of purple and green. Good luck! 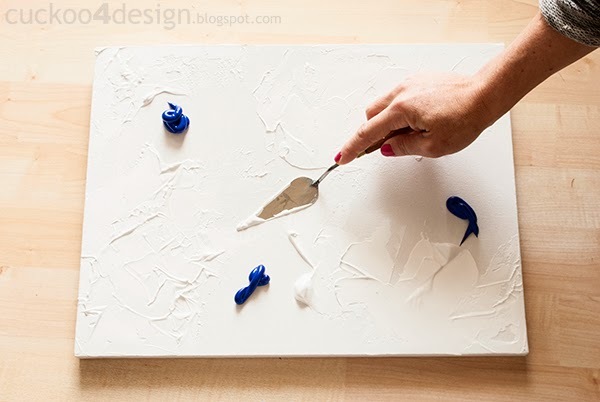 What is the name of the real paint you use in this tutorial? I love that color! Is the blue you use cobalt blue? 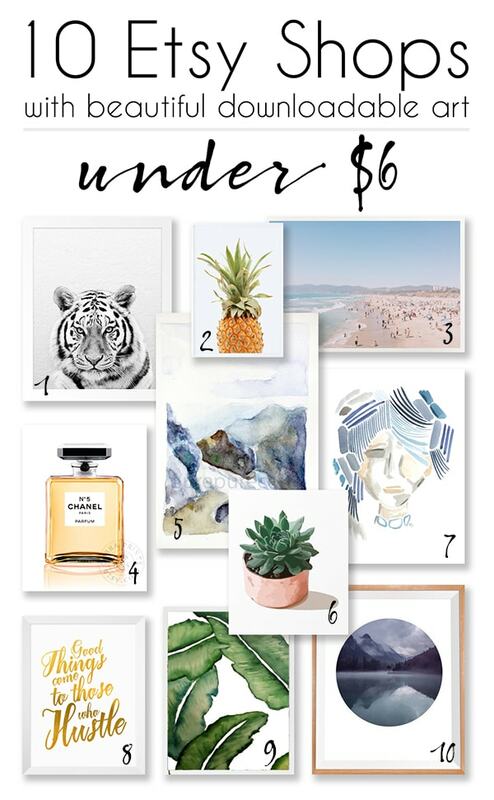 Gorgeous art! I’m so so try but I don’t have the tube anymore so I’m not sure what the name was. Thanks for inspiring others ! I just have a question..
Can I substitute the acrilyc paint for oil paint?? Thank you so much for sharing! Very pretty and so inspiring! Thanks I’m glad you like it.